When you think of a calculator for college, you probably think of difficult math classes and all those crazy 15-digit-long calculations. Those thoughts are probably all realities if you're taking upper-level calculus classes. Yet there are many other classes and scenarios in college life when a basic college calculator will come in handy. For example (though it can be a little scary), you might want to add up costs to see how your tuition expenses break down. Or, if you're keeping track of your fiances, you'll need a calculator as part of your dorm stuff to quickly see how much money you can spend. We know that most cell phones and computers have calculators built in. 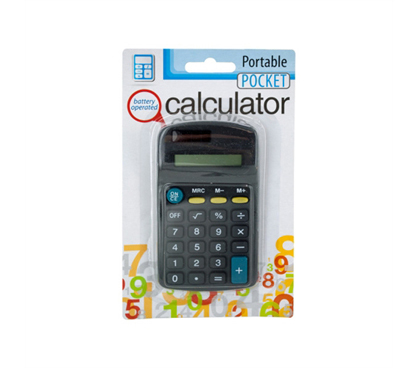 Still, this Basic Pocket Calculator is much easier to use than operating those tiny cellphone buttons or clicking numbers with your mouse. This cheap calculator is the kind of device you grew up with throughout your younger school years! So use what's familiar. You really don't have to be a math major to include a simple calculator in your college supplies. And c'mon, don't strain your mind further by attempting all those tuition-related calculations in your head!